Category: : Heritage Hotel equivalent to 4 star hotel. 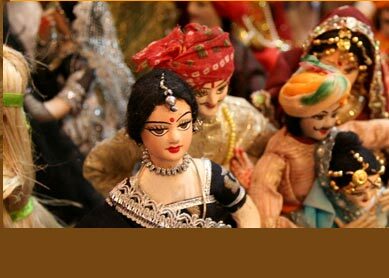 Located in The Golden City Of Rajasthan, the Gorbandh Palace is one of the most popular heritage hotel of Jaisalmer. The palace, owned and managed by HRH Group Of Hotels, with its high standard of hospitality aim to give tourists world class accommodation along with greater opportunity to enjoy exploring the rich culture and history of Jaisalmer - the most exotic city of Rajasthan. The total 67 rooms of the hotel include 64 deluxe rooms and 3 deluxe suites. 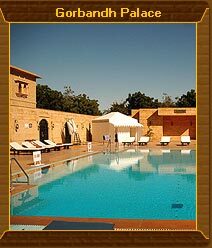 Each of the rooms are spacious and air conditioned, and overlook lawns of the hotel or swimming pool or the magnificent fort. Facilities like private balconies, satellite TV, telephone with international dialing facilities, tea/coffee maker and mini bar are given in every room, which are meant to heighten guests holidaying experience. Three restaurant of the Gorbandh Palace Heritage Hotel, The Rasoda serving Continental, Indian, Chinese and Rajasthani cuisine; Bageecha, the open air garden restaurant; and Sarovar, the poolside restaurant make guests dining experience unique. Besides, the Jhilmil Coffee Shop and Safari Bar, serving a fine range of domestic and international liquor are favourite spot to enjoy leisure while being at the hotel. The large range of services and facilities, which every guests of the hotel are privileged to avail are 24-hr room service, doctor-on-call, Internet, same day laundry, currency exchange, card acceptance, car rental, travel desk assistance, airport transfer, tour guide, conferencing and banqueting facility, and etc. 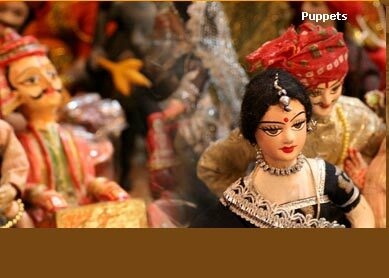 Traditional Rajasthani folk music and puppet shows are organised by the hotel. Camel safari arranged by the hotel officials take guests to the Sand Dunes of world famous Great Indian Thar Desert. Passing through the golden sand land while sightseeing several of villages, havelis, forts and palaces and temples are great joy for tourists. Further sightseeing tour of Jaisalmer takes you to visit its popular spots like Manak Chowk and Haveli, Gadsisar Lake, Nathmalji-Ki-Haveli, Patwon-Ki-Haveli, Jain Temples and Tazia Tower.